Wise Disk Cleaner is an application that will automatically delete temporary files from your hard disk. It is a safe program, unless you configure it bad, do not delete important files by mistake. Wise Disk Cleaner is the companion of Wise Registry Cleaner. Developed by the same manufacturer, has an interface and a similar operation. Only instead of the registry, it is responsible for the hard disk, deleting temporary and unnecessary files that take up space and can be sources of delays. After installation, Wise Disk Cleaner helps you step by step through the configuration. You choose the types of files to be deleted, the hard disk sectors to analyze and more. The default settings are very safe and you should use them if you do not know at the bottom of Windows. After finishing the configuration, Wise Disk Cleaner is ready to analyze the disk for files to delete. The analysis is finished you can proceed to the elimination itself. The files can be erased forever or put in the trash. 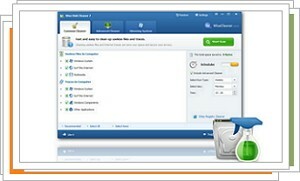 Cleaning with Wise Disk Cleaner can be scheduled in time and run automatically on a regular basis.